BITCOIN has received a ratings grade which has shockingly been outperformed by lesser-known altcoins in the first cryptocurrency review delivered by top financial institution, Weiss Ratings. The ratings agency claims they were hit with cyberattacks ahead of the historic ratings release which they blamed on Korean hackers who were trying to defend Bitcoin from the prospect of a negative rating. The rating said: “Bitcoin gets excellent scores for security and widespread adoption. “But it is encountering major network bottlenecks, causing delays and high transactions costs. Weiss Ratings founder Martin Weiss said of the cyberattacks: "Earlier commentary on social media expressed considerable fear we were about to release negative ratings on their preferred currencies. "So this may be an attempt to thwart our release today." In a surprise to many cryptocurrency traders, Ethereum outperformed Bitcoin gaining a “good” B rating compared to a “fair” C+ rating for its better known competitor. Novocain and SaluS were both deemed weak as they earned a D rating, while relatively unknown Steem also outperformed Bitcoin to earn a B-. Mr Weiss said: “Despite extreme price volatility, cryptocurrencies have a bright future and the potential to deliver unusually large profits to investors. The ratings agency released a statement amid concern its ratings had been misunderstood as overly negative. It read: “Other rating agencies use a scale from triple A to single C. In that scheme a B grade is “junk” and a C is close to failure. “In contrast, Weiss Ratings’ B is ‘good’ and C is ‘fair’. The ratings shock come as Bitcoin expect and CEO of Shopin, Eran Eyal, said he had “no doubt” the currency would hit $100,000. 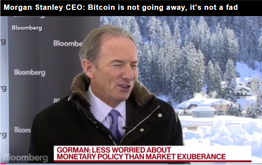 The ratings agency took the opportunity to explain why Bitcoin did not receive a higher rating. While no coin received an A rating overall, Bitcoin did earn the highest rating on its Fundamental Index. However, the Fundamental Index is just one of the major metrics used to calculate a currencies rating. Bitcoin loses out on the Risk Index owing to its highly volatile price and the Technology Index due to the energy consumption of mining and the lack of scalability of the system to meet demand. Mr Eyal said it is important to separate Bitcoin from other types of cryptocurrencies such as Ethereum or Ripple. He said each cryptocurrency has its own “business model” to differentiate from one another. Speaking on CNBC, Mr Eyal said: “I have no doubt that Bitcoin is going to reach well-beyond $100,000. Have a look at how it has climbed over the past. “I think it’s important not to just look at it at this moment in time but also to look at it historically at what has happened around the world.